On 16 March 2015, the United Nations University, in collaboration with the Ministry of Foreign Affairs of Japan, hosted “The UN at the Crossroads: Embarking on a Year of Reform and Renewal”, a symposium featuring UN Secretary-General Ban Ki-moon and Japan’s prime minister Shinzo Abe to mark the 70th anniversary of the United Nations. As the world enters a year of intense summitry, the UN is reviewing policies and operations across virtually all its mandate areas. The event zoomed in on the organisational reforms and new policy initiatives needed to adapt to a rapidly evolving set of challenges in the fields of peace and security, development, and humanitarian assistance. In his address, the Secretary-General delivered a strong message on the need for united action from Member States to ensure that this year lives up to its potential. 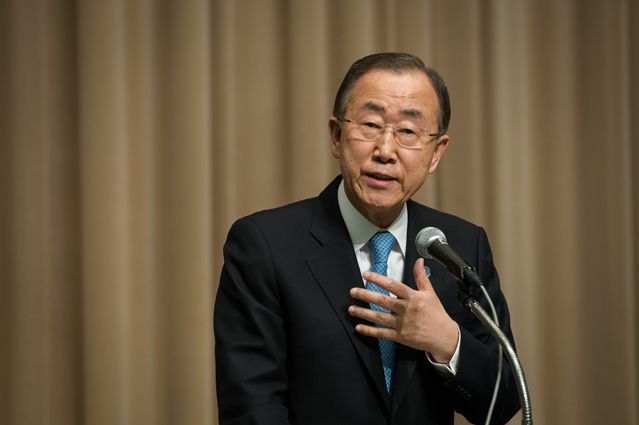 Among the major summits of 2015, the Secretary-General highlighted the UN Summit for the Adoption of the Post-2015 Development Agenda, the Third International Conference on Financing for Development, the 21st session of the Conference of the Parties to the United Nations Framework Convention on Climate Change — which is heralded to finally result in a universally binding climate agreement — and the recent World Conference on Disaster Risk Reduction held in Sendai, Japan. The Secretary-General pointed out the continuing demand for the UN as a mediator and meeting ground for countries, and stressed the need to reform and reinforce the organisation to maintain its relevance and effectiveness in a changing global security environment. The Secretary-General accentuated priority issues of gender equality and youth empowerment, and introduced the recently launched Human Rights Up Front initiative, which will establish an early warning mechanism for violations of human rights or humanitarian law. The Secretary-General also thanked Japan for its strong support of the UN’s work, and expressed his hope for genuine cooperation between Japan and its neighbouring countries. 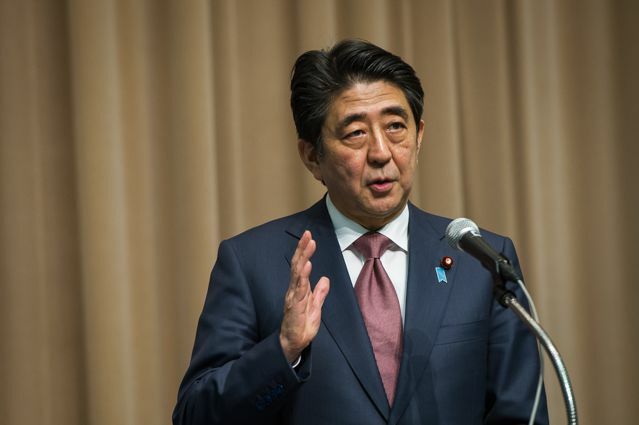 Following the Secretary-General’s remarks, Prime Minister Abe reaffirmed Japan’s commitment to contributing substantially to the UN, and presented various focus areas in which Japan may take initiative. These include promoting the idea of human security and advancing development in the Asia-Pacific region and in the world, with a particular emphasis on health and education. He also mentioned Japanese solutions regarding an aging population and the need to build an inclusive and resilient “platinum society”. Prime Minister Abe joined the Secretary-General in calling for true international collaboration to confront the global challenges faced by the UN, further stating that the latter was obliged to continuous transformation — including that of its Security Council — to remain able to address global challenges. In this respect, Prime Minister Abe expressed Japan’s willingness to become one of the permanent members of the Security Council. The speeches were followed by a panel discussion moderated by Sebastian von Einsiedel, Director of the UNU Centre for Policy Research, that brought together dignitaries, practitioners and academics: H.E. Mr. Yasuhide Nakayama, State Minister for Foreign Affairs of Japan; H.E. 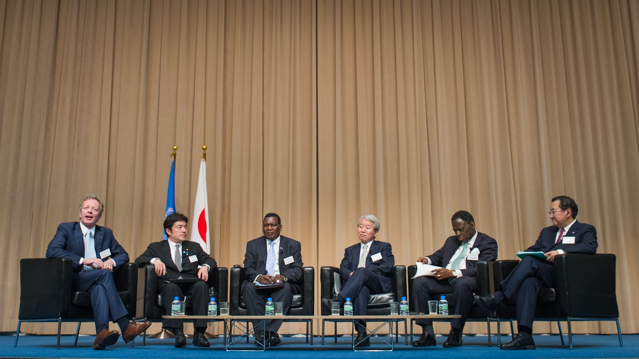 Dr. George Thapatula Chaponda, Minister for Foreign Affairs and International Cooperation of the Republic of Malawi; Dr. Akihiko Tanaka, President of the Japan International Cooperation Agency; Under-Secretary-General Dr. Babatunde Osotimehin, Executive Director of the UN Population Fund; and Professor Toshiya Hoshino, Vice Rector of Osaka University. The panel discussion provided insight on ways to make the UN “fit for purpose” to respond to mounting environmental and security challenges and to ensure that this year of great promise will not be a missed opportunity. The discussants debated the shifting contexts and roles of official development assistance and humanitarian assistance, explored potential reforms of the UN peacebuilding architecture, and agreed on the need to reform the Security Council to reflect the current international reality and the changing power dynamics between states and non-state actors. All of the speakers underlined the importance of inclusiveness and equality, as well as adequate strategies for resilience, to help create a peaceful global society. The debate also touched upon gender issues and the measurement of development outcomes. In this context, the discussants affirmed the usefulness of global frameworks, such as the Millennium Development Goals and the upcoming Sustainable Development Goals, in mobilising, directing, and coordinating local and international efforts.